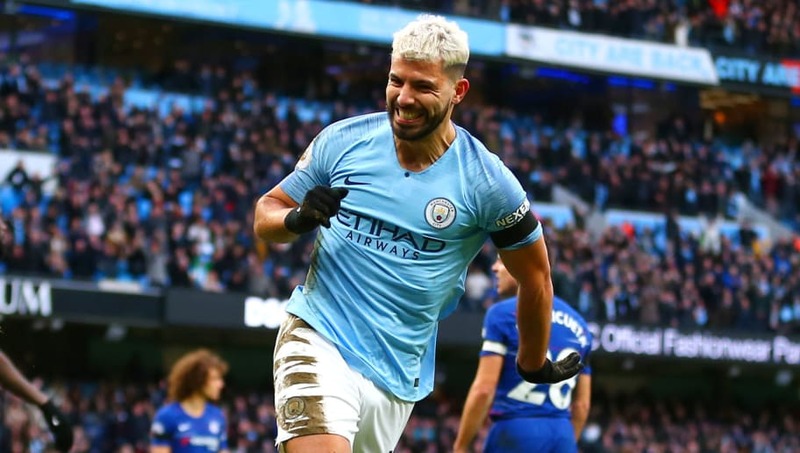 Manchester City forward Sergio Aguero scored his 15th hat-trick for the club this month in the 6-0 thrashing of Premier League rivals Chelsea, further establishing himself as the greatest player in the team's rollercoaster 139 history. Aguero arrived in Manchester as City's £38m record signing back in 2011 after making his name in Europe at Atletico Madrid. He had only just turned 23 years of age at the time and has given the best years of his career to City, still continuing to perform at an incredible level. Here's a look back at each one of his 15 City hat-tricks. Having managed a brace on his City debut against Swansea in the opening game of the 2011/12 season, Aguero went on to score a hat-trick in just his fourth Premier League game. Operating alongside Carlos Tevez, Yaya Toure, David Silva and...ahem, Adam Johnson, in the attacking third, he netted all three of City's goals in the 3-0 win over Wigan, his fourth, fifth and sixth of the season mere weeks after arriving in England from Spain. 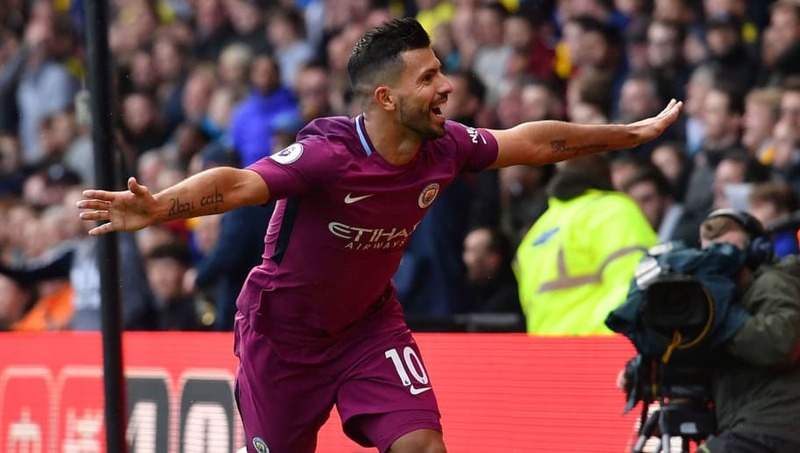 A challenging second season in City colours meant that Aguero had to wait until the 2013/14 campaign for his next treble, which came in an FA Cup fourth round tie against Watford. It was a rather difficult game for the eventual Premier League champions against the second tier Hornets, even going 2-0 down in the first half. Aguero put City back on level terms in the 59th and 78th minutes, before the go-ahead goal from Aleksandar Kolarov, and later sealed his hat-trick in stoppage time. Aguero netted all four goals when City put Tottenham to the sword in the Premier League in October 2014, scoring twice in either half and even winning his own penalty for the third goal. "...it is difficult to remember the last time one of City’s players tormented the opposition so relentlessly and mercilessly," gushed the match report from The Guardian. Aguero even missed a penalty during the game that could have given him five goals. Win-less in their first four Champions League group games of 2014/15, City were staring early elimination in the face until Aguero's hat-trick against Bayern Munich on matchday five. The English side actually took the lead when Aguero scored from the penalty spot in the first half, only for 10-man Bayern to turn the game around to lead with only minutes remaining. But City's hero then scored twice in the closing stages, with victory over Roma on matchday six, without an injured Aguero it must be said, sealing unlikely progress to the knockout stages. Aguero's most famous City goal was the winner against Queens Park Rangers that won the 2011/12 Premier League title with virtually the last kick of the season and he returned to haunt the same opposition with a hat-trick in a 6-0 thrashing three years later. The Argentine needed just four minutes to open the scoring that day as City brushed QPR aside with little difficulty. He scored a second to make it 3-0 soon after half-time, before completing his hat-trick with City's fourth goal from the penalty spot. Aguero became only the fifth player in Premier League history after Andrew Cole, Alan Shearer, Jermain Defoe and Dimitar Berbatov to score five goals in a game when he faced Newcastle at the Etihad Stadium early in the 2015/16 season. The Magpies had no response and Aguero, who was nursing an injury during the game and was substituted early, scored his five goals in just 66 minutes. He subsequently missed City's next seven games in all competitions with a hamstring issue. 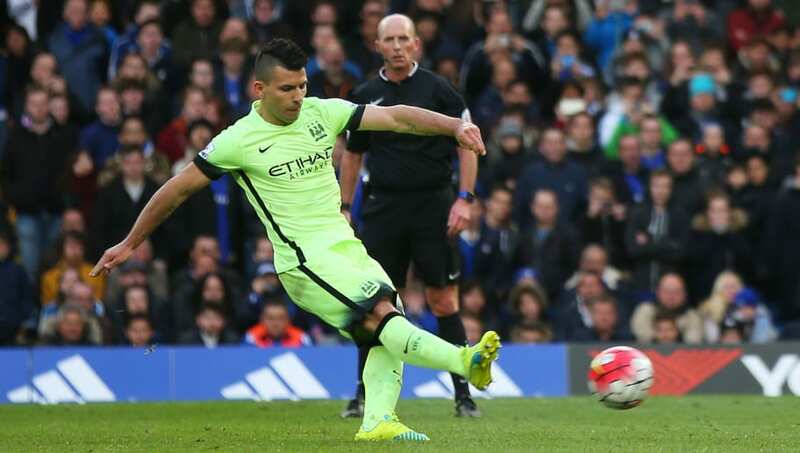 Aguero's first City hat-trick away from home came as the sky blues pummelled a sorry mid-table Chelsea team at Stamford Bridge in the final stretch of the 2015/16 campaign. The result helped City strengthen their grip on a top four place, while Aguero's hat-trick came in the middle of a run of him scoring at least once in five consecutive Premier League games. 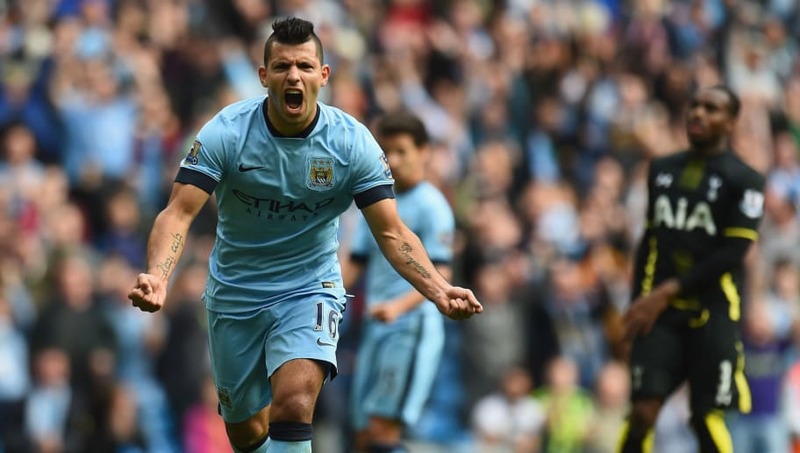 It also marked Aguero's fifth consecutive season as City's top goalscorer. Aguero wasted little time in getting going when Pep Guardiola arrived as City manager in 2016 and scored a hat-trick in only the new coach's second game in charge, having earlier netted once just four minutes into his first three days previously. The hat-trick against Steaua Bucharest in the two-legged Champions League qualifier steered City to a 5-0 win in the first leg in Romania, the second, fourth and fifth goals, and ensured Guardiola would be able to rotate his team for the formality of the second leg a week later. 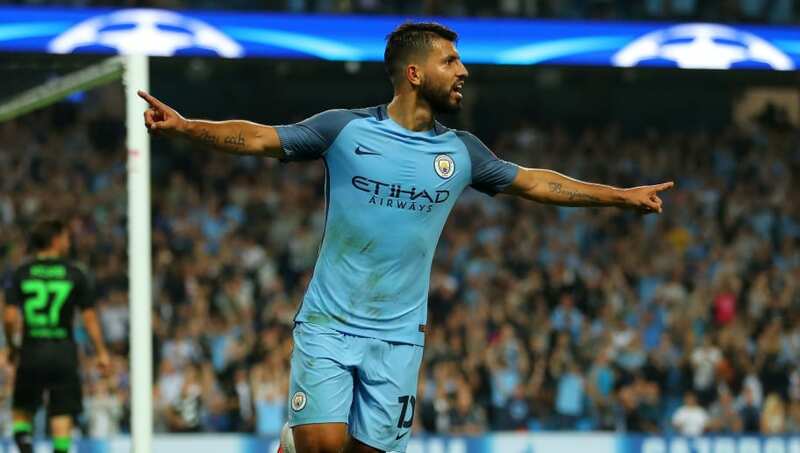 Having scored a hat-trick in the qualifying round, Aguero subsequently scored another as City kicked off the 2016/17 group stage with a 4-0 thrashing of Borussia Monchengladbach. With a hat-trick against Bayern Munich under his belt two years earlier, he became only the third player to score two hat-tricks for an English club in the Champions League (excluding qualifiers) after Andrew Cole and Michael Owen. Rather bizarrely, he failed to score again in the group stage that season. Although he would soon find himself on the bench on a handful of occasions in the first half of 2017/18, Aguero began City's record breaking season in style with five goals in his first five Premier League games of the campaign. Three of that flurry came in the form of a hat-trick against Watford as City won 6-0 on the road. Aguero scored the first two goals of the game inside 31 minutes, followed by his hat-trick goal, City's fifth of the day, towards the end of the contest. 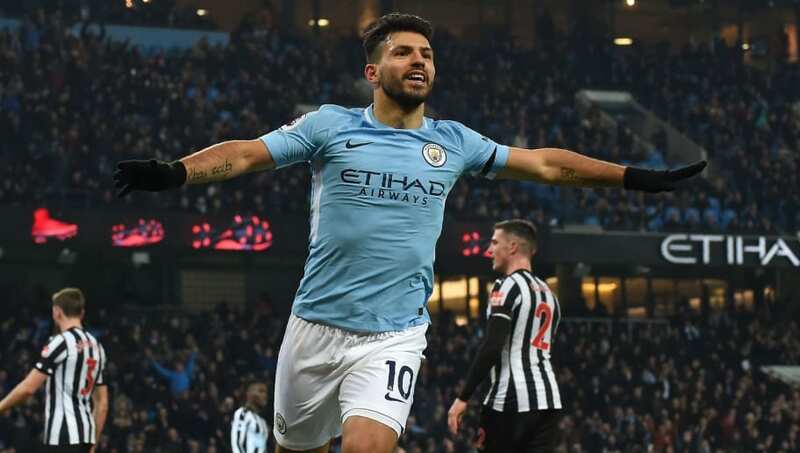 Just under two-and-a-half years after his five-goal haul against Newcastle, Aguero bagged a second career hat-trick against the Magpies in January 2018 in a 3-1 City win. City had just suffered their first Premier League defeat of the season at the hands of Liverpool a week earlier and Aguero's treble at the Etihad ensured it was an isolated blip and no more. WIth a first half header, a right footed penalty and a left footed shot to complete the scoring, it was also a 'perfect' hat-trick for City's South American hero. 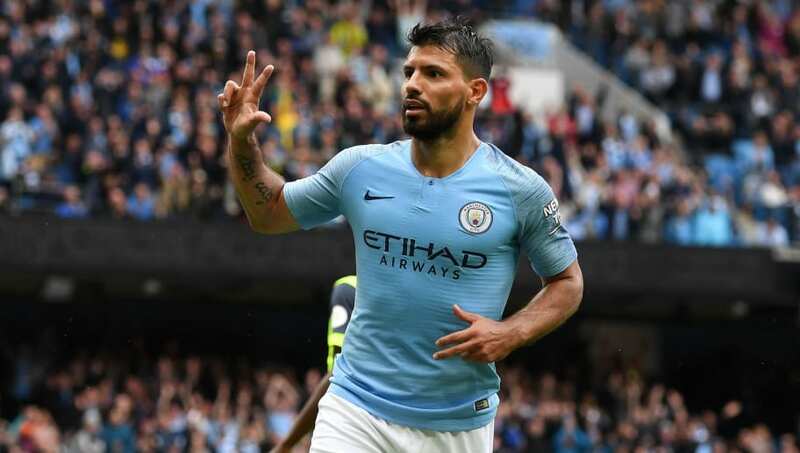 Shortly before his 2017/18 season was prematurely curtailed by a knee injury, Aguero bagged a four-goal haul in the Premier League against Leicester as City ran out 5-1 winners. All four of Aguero's goals that day actually came in the second half and moved his tally for the season in all competitions to 29. He would later score his 30th and final goal of the season in the EFL Cup final against Arsenal. After three hat-tricks in 2017/18, City fans didn't need to wait long to see Aguero bag his first treble of 2018/19, doing so in the second Premier League game of the season. Huddersfield were the victims put to the sword on that occasion, with Aguero scoring three times in the 6-1 thumping. He found the net twice in the first half and was substituted almost immediately after his hat-trick goal in the 75th minute after a job well done. 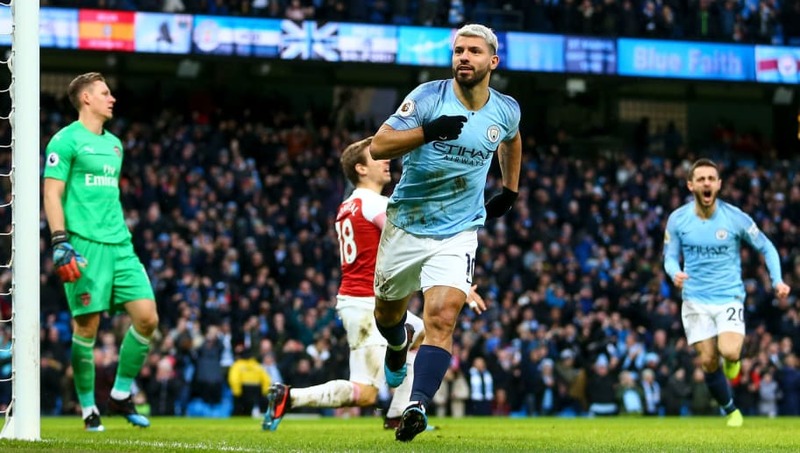 An Aguero hat-trick against Arsenal helped City bounce back from a shock defeat against Newcastle, with the Agrentine supremo breaking the deadlock in less than a minute. The Gunners equalised soon after, but Aguero's second just before half-time put City back into the lead, with his third, which struck his arm by his own admission, sealed the result. "I honestly think it was the chest but now I saw on the TV it was a handball," he said after. 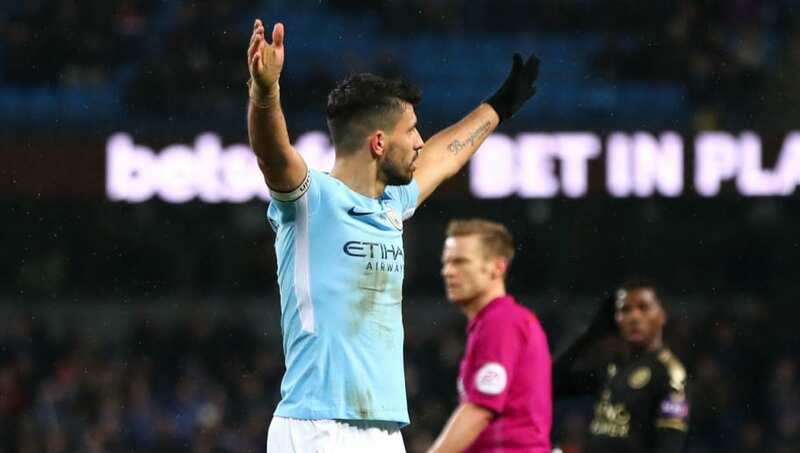 City inflicted Chelsea's heaviest defeat in 28 years when they humiliated their 'big six' rivals in a 6-0 annihilation at the Etihad in February 2019 and Aguero was at the centre of the damage. With City already 1-0 up, his first goal of the day should have been an easy back-post tap in, yet the club's all-time leading scorer somehow missed the target. Moments later he made up for it by finding the top corner 25 yards from goal, before later scoring his team's third and fifth goals of the game.